All pennies have a pressed design on one side. Each lot is for 100 Elongated US Pennies from all over - usually West Coast since this is where I am located - but they can be from anywhere. Cat Shape Anti-static Felts Table Mouse Pad Dust-proof Desk Pads Coffee. Item Specifics. Modified Item No. New List Item. Embossed patterns look delicate and touch great. Clothing,shoes&Accessories. Health&Beauty. BRONZE MEDAL THOMAS JEFFERSON USA 1 5/16 Inch US MINT. Shipped with USPS First Class Package. 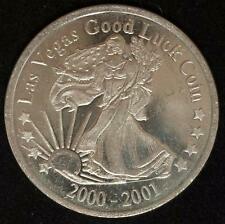 From Las Vegas, Nevada 2000-2001 Good Luck Token. 2000-2001 Good Luck Token. This is being sold by order of the Johnson Estate. These Rare Hobo Style Coins Are Not Hand Carved. "Piece of the Pie" Series. THEY ARE CUSTOM DIE - COIN MINT STRUCK! "ENJOY Your New Coin". "Series 14" . 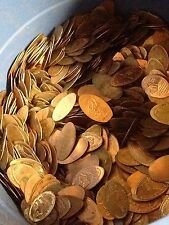 - Do NOT Miss Out On Owning One Of These Rare Coins -. Hope you could wait patiently for your things. Lot Of 20 Assorted Medals Alaska Hawaii Utah Hudson NY World Fair. Shipped with USPS First Class Package. See photos for details. The price is affordable and the collection is fun. Souvenir Art, Collection Gifts and Festival Decoration Gifts. [Material] Brass. I will not make you suffer any lose. "You'll get 100% of what you see in the picture. Has a nice frosty silvery tone. The edge is smooth with no detracting dings. The reverse is plain. It is uncirculated. Atwood Coffee NY685F. In excellent condition like the one shown. The item in the picture is the item you will receive. Composition: Brass. (1893) R-PHL-88 S.H. Quint & Sons Mfrs. of the late 19th Century. New York City Marathon 25th Anniversary Medal New York Road Runners Club 1994!@! 2 3/4" wide 2 1/2" tall. This is for a Green River Whiskey, The Whiskey Without Regrets Good Luck Token. In very nice collectible shape. It is a little larger than a half dollar. See pictures for details and condition. Please ask any questions. I will combine shipping. Thank you for looking. Material: Zinc A lloy. Affordable & Fun To Collect. I will not make you suffer any lose. You get 100% what you see in pictures. 100% B rand N ew & H igh -Q uality. Information on Francois Arnaud and Gustave Martin is scarce and difficult to locate. 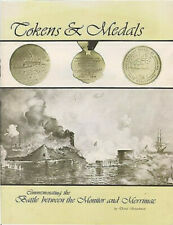 Elongated / Pressed Penny Souvenir Book / Album. (Pennies shown are for example only). Material: Zinc A lloy. Affordable & Fun To Collect. 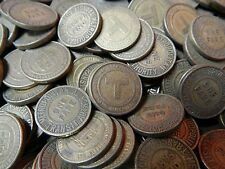 “Coins are surprising gifts to friends and family.”. Thickness: 3mm/0.12". The item in the picture is the item you will receive. I think that about covers it. Composition: Brass. I have what you need! WEIGHTS 137 GRAMS. ISSUED IN 2011. MATERIAL IS COPPER LAYERED IN 24K GOLD. Dear friends. Nothing is more important than your concerns and frustrations; we will do our endeavor to solve your issues. Q.What should I do if I didn't receive my item?. Product weight: 26g. After-sale: ★★★★★. The edge contains the word "bronze" and the appropriate French mark. The artist, Delamarre is very well regarded. These are avidly collected and are quite valuable. THIS IS THE REAL THING AND NOT A LATER REPRODUCTION. Material: Zinc A lloy. I will not make you suffer any lose. You get 100% what you see in pictures. The badge is shaped like the Liberty Bell with an image of the Betsy Ross House on the Bell. ADD US TO YOUR FAVORITES LIST AND STAY IN TOUCH WITH THE REGULAR OPPORTUNITIES WE PRESENT WEEKLY ! BE SURE TO REVIEW WHAT OTHERS WHO HAVE USED OUR SERVICE IN THE PAST HAVE HAD TO SAY ABOUT THEIR EXPERIENCE. A HOBO Nickel can be several variations. It is often a fantasy copy of a real coin or of one side of a coin. It can be a real coin with an image pressed in to it or the finer craft is to have a variation carved in to a nickel. 1973 DELTA QUEEN STEAMBOAT - SCARCE! NO RESERVE! Material: copper plated silver. Quantity: 1pc. Weight: 24g. Atwood Coffee NY630AQ. In very good condition like the one shown.